Professor Ikhlaq Sidhu and I recently started talking about how the interest of corporations in the innovations created by startups is leading to changes in corporate R&D models, an area he has been studying for some time. As we continued our conversations we felt that it will be important to start publishing some of our thoughts. This is the first of what we hope to be a series on posts on how startup innovation is impacting corporate R&D models. A great deal has changed in corporate innovation since the days of Bell Labs and Xerox PARC. While these models of advanced work led to so many innovations and created tremendous broad economic value, though not always to the lab’s corporate owner, it is clear that large scale, insulated corporate research is no longer the most common model for entering new markets or developing technologies of the future. Even Alphabet is re-evaluating the mission of Google X. What has changed? For most companies, open innovation and new venture acquisitions have become extensions of the firm’s advanced R&D portfolio. At the same time entrepreneurs and their investors have become much more effective and skilled at efficiently creating new startups and bringing technology and business model innovations to market. And finally, a significant fraction of University lab work has now evolved from the traditional “publish or perish” model to one that is today closer to demonstration, design-oriented, and more applied than ever before. All of these changes are now converge towards a new model for creating and managing portfolios of innovation. Whereas corporations were looking primarily to university research labs as their primary places to look for technology innovation outside their own research labs, companies today are more commonly also looking at the innovations generated by startups in addition to university labs. And they try to gain access to the startups, the university teams, and their innovations by acquiring them, or by making venture style investments in them. Many groups believe that they just need to find a magic technology that they can bring into their firms, often by just being introduced to the firm. They spend lots of time looking at new ventures and university projects in order to report what is happening back to a parent organization or parallel organization, which is largely consumed with other issues, like keeping the main business running and satisfying their existing customers. As a result, a very significant amount of time goes into communicating back and forth between the innovation focused groups and the main business units, but most proposals for acquiring innovation are not executed. In this case, we are not talking about acquisitions for market share, but instead for new markets or new technologies. When acquisitions happen, particularly of early stage startups, the firm ends up killing the new venture. This is because the corporation is not ready to properly incorporate the startup into its existing operations, or is not prepared to have it run as an independent unit. Conversely, when the firm delays too long, the successful startup becomes prohibitively too expensive to acquire. There is a lot of “early stage confusion” on the topic of “why are we doing this”? Is this R&D, is it a future business unit, is it a marketing function to show we are leaders to our customers, and how do you justify the time that we are spending on this? This leads to the classic “Air Sandwich” in the organization. The top leadership loves what it sees in terms of demos, visions, and plans. The people focused on new innovations have great skill and are working hard. And yet, there is no momentum in the middle. The reason it is so hard is because there oftentimes corporations do not have an overall long-term innovation strategy and clear understanding about the role startups and university labs will play in such a strategy. Furthermore, every innovation idea is being managed on a case-by-case basis. There is no concept of innovation portfolio in the typical approach. And finally, there is no mapping between the internal portfolio of innovation projects and the external portfolio of ventures and technologies. That is to say there is no attempt to identify complementarities, differences, and similarities between the innovations created internally, most likely by the corporate R&D organization, and those that are accessed from the innovation clusters. Consider this clarifying and well-accepted model below. When acquisitions are for market share, then it is driven by an existing core business (Horizon 1) and the acquired entity is incorporated into the acquiring unit. 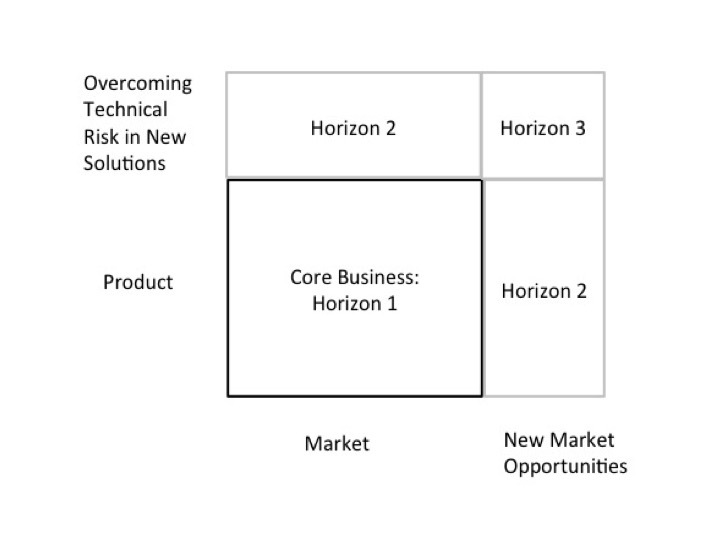 There are always new initiatives at every corporation that test the opportunity to build new businesses in new markets and introduce new product innovations (Horizon 2) in an effort to extend existing business models. The corporation must learn to execute in these new areas to stay successful. Horizon 3 opportunities are more speculative investigations of potentially disruptive technologies and business models and enable the corporation to search for its future growth engines. 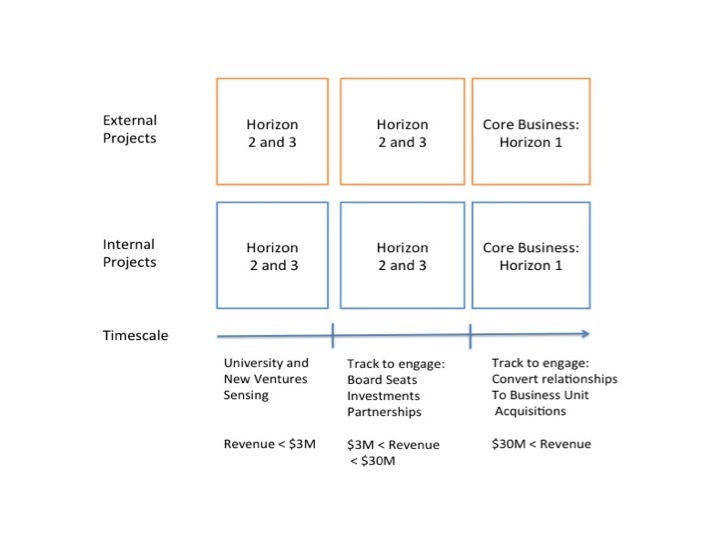 Now consider that some experiments in Horizon 2 and 3 are actually not within the walls of the corporation but they are start-ups (i.e., new ventures) and/or technical projects in universities. In this case shown below, the Blue X symbols represent projects inside the firm, where Red X symbols represent new ventures outside the firm. First, projects outside the firm can be considered extensions of the internal advanced R&D and business creation process. And second, when mapped in this way, all the projects together make a portfolio, which can be financially managed like any other portfolio. In fact, these portfolios may even be be managed using the same approaches venture investors utilize to successfully manage their portfolios. 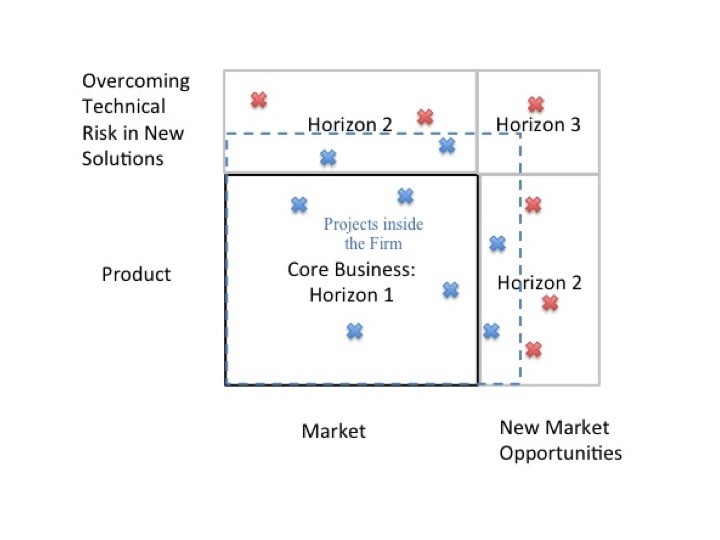 Over time, some of these projects (external and/or internal) fail and must be removed from the respective portfolio, while others emerge as promising new businesses and become candidates to transition from Horizon 3 to Horizon 2. They are on their way to eventually become the corporation’s next-generation business units in Horizon 1. During this transition, the new businesses should receive additional resources from the corporation and their staff be augmented with individuals, particularly executives, who know how to start scaling businesses. Additionally, for those of the startups that show such promise and where the corporation has previously made a venture investment, the corporation may decide to acquire them outright, set up a joint venture with them, or find some other way to gain access to their innovation(s) for its own exclusive benefit. A simple but important point, all of these projects need both communication and relationship management, not just tracking on a list. As projects become more relevant to the corporation, the engagement must change from awareness, to board positions and additional strategic investments, partnerships, supplier agreements, and hopefully acquisitions. These stages must also be managed strategically with an understanding of timing in the relationship as well as strategic understanding of what the new venture can do for the firm. Most firms do some variation of this already. In fact, many business unit size acquisitions started out as friendly relationships while the new firm is much younger and the relationship is cultivated over time. However, few corporations today take advantage of the innovations created by startups in a systematic way that shows strategic intent. Most of them work with startups in a more episodic and reactive manner, which frequently leads to unsuccessful results with little or no ROI. The new idea here is that it can be done systematically and strategically instead of as random events. So what does all this mean for your firm. Here are the simple steps. Make a list of your internal innovation projects. Make a list of the startups you are monitoring. If you are not monitoring any, you might want to rethink your approach. Many corporations will implement this idea differently incorporating their internal processes and even the distinct characteristics of their industries. However, to get started and make this practical, consider column headings such as firm name, stage in portfolio, insights learned per firm, engagement priority, engagement or dis-engagement decision, and of course the changing context and arguments of strategic fit. Large corporations and small firms and even university projects are symbiotic, but there are natural barriers that keep them from working together. While this is a larger issue to solve with education and research, for action-oriented firms, the issues are really more about timing, building relationship, and overall portfolio based tracking. Our position is that its time to step away from future stories about how the world will change and re-introduce some basic portfolio tracking methods into the innovation process. And the good news is that it is a problem that is tractable to solve. With an approach to innovation of this type, there will be less reliance on explaining how “deep learning” or “virtual reality” works and more on how the spreadsheet works, and finally your CFO will understand what you are actually talking about.